Crop duster, aerial applicator or ag pilot? All of the above! 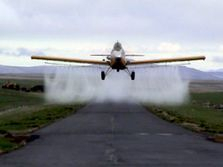 Ag products delivered on crops used to only be available in a dry form, so the pilot who distributed these crop protectors became known as "crop dusters". Aerial applicators are instrumental in helping growers protect crops from insects and diseases. Aerial application is often the safest, fastest, most efficient and most economical way to treat a crop when pests or disease threaten it. Aerial application is used both by conventional and organic growers. Both farming methods use pesticides, just different types. Washington Grown featured Gavin Morse, a Washington State aerial applicator, in their season 2 episode about barley. 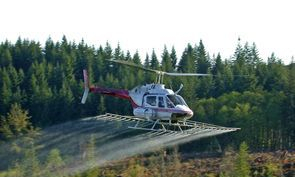 In addition to the applying herbicides, insecticides and fertilizer to fruit, vegetable and feedgrain crops, planes and helicopters are used to fight forest and grassland fires, harvest Christmas trees, and assist in the rehabilitation of public lands devastated by fire. 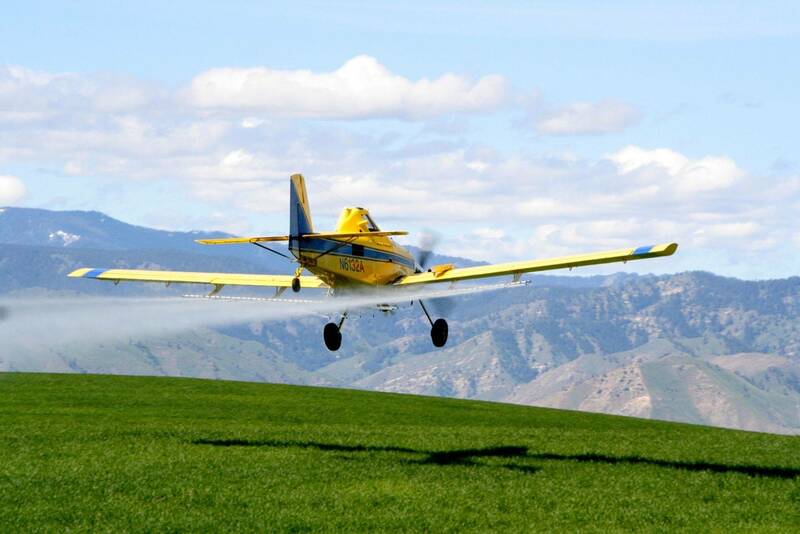 An aerial applicator needs to be a pilot, a licensed pesticide applicator and computer whiz all in one. Lots of applicators start as an apprentice with an experienced pilot and training can take 3-5 years. Training continues throughout a pilot's career. Continuing education includes classroom work but may also include participation in the National Agricultural Aviation Association's (NAAA) Professional Aerial Applicator's Support System (PAASS) program or an Operation S.A.F.E. (Self-regulating Application and Flight Efficiency) Clinic. S.A.F.E. requires a pilot to have his aviation and application skill evaluated under actual field conditions. Today's crop spraying planes are equipped with mapping technology that makes it possible to pinpoint exact areas to be sprayed and assures even distribution; thus protecting the crop and the environment. Drift is illegal and rare in Washington state. Aerial applicators are trained to apply products in a precise manner and only under ideal weather conditions to prevent drift. Aerial applicators live in the communities where they work, so they are very concerned with the health and well-being of their families, friends and neighbors. What tools do applicators use? Today’s aircraft utilize sophisticated precision application equipment such as GPS (Global Positioning Systems), GIS (Geographical Information Systems), flow controls, real time meteorological systems and precisely calibrated spray equipment. Precision application equipment allows less pesticide product to be applied to more acres, greater fuel efficiency, and more targeted delivery. How is aerial application regulated? Individual states regulate the pesticide application certification and certain loading and storage containment requirements. The federal agencies include FAA (Federal Aviation Administration), EPA (Environmental Protection Agency), USDA (United States Department of Agriculture), FDA (Food and Drug Administration), OSHA (Occupational Safety and Health Administration), etc. In Washington State, pesticide application is regulated by the Departments of Agriculture and Labor & Industries. There 50 ag pilots in Washington State. The average age is 50+, so there are lots of opportunities for younger pilots to train and work! Aerial applicators treat 71 million acres each year. Most of the crop protection spray you see consists of water. Depending on the product, it could be as little as half a cup of crop protection per 100 gallons of water. Aerial application accounts for just under 20% of all applied crop protection products on commercial farms and nearly 100% of forest protection applications. 87% of the aircraft used are fixed-wing aircraft; the remaining 13% are rotorcraft/helicopters. when timing is critical, an airplane or helicopter can accomplish three times as much application work as any other form of application can. Click on the image below for more information about the benefits of aerial application.